How might we nudge millennials with Type 2 Diabetes towards better eating habits? Type 2 Diabetes is a growing public health issue in the world today, affecting 3.3 million people in the US and costing the United States a total of 245 billion dollars per year. By 2050, diabetes prevalence is projected to grow by another 33%. Millennials are the currently the fastest growing population with diabetes. Our extensive research with healthcare professionals, patients, and family members helped us understand that eating behavior change is crucial to better diabetes outcomes. 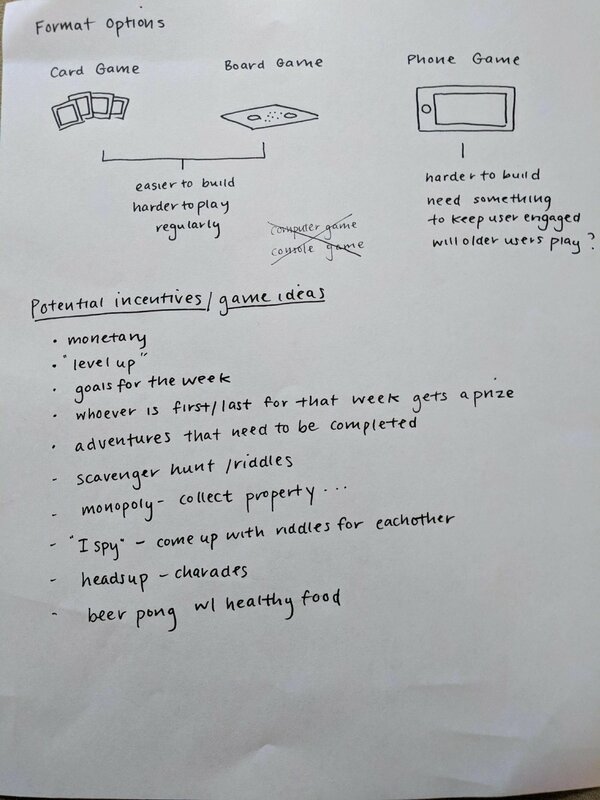 We consequently designed an Instagram-based diabetes food challenge that taps into behavioral economics to challenge the way you eat, offering social capital and healthy snack reward boxes. Since we were able to leverage Instagram to test our project, we were able to quickly test multiple iterations of our project. 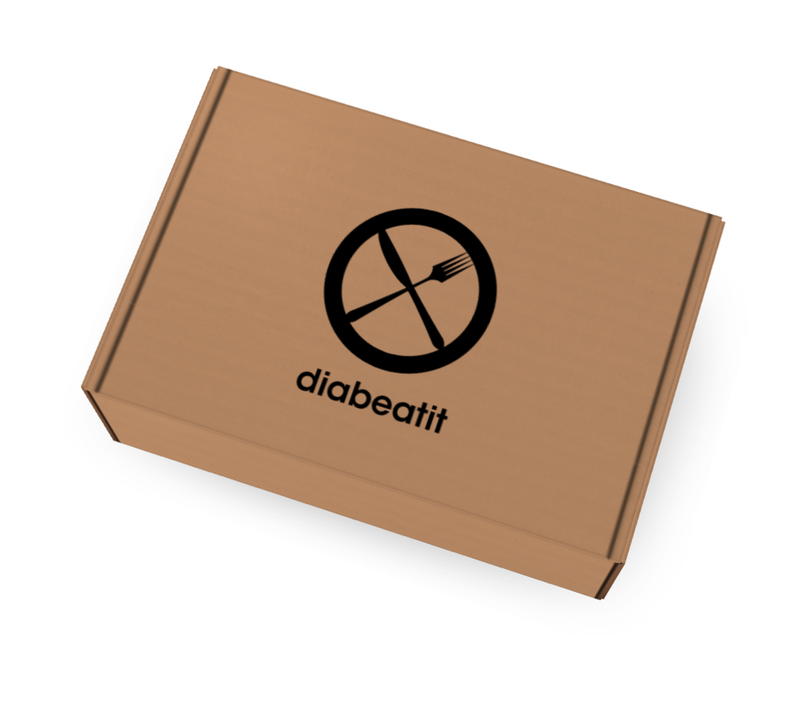 Please visit us on Instagram @_diabeatit_ to see our account! Role: Conducted interviews with doctors, patients, and family. Led prototype ideation, concept testing, and pitch preparation. We conducted 12 qualitative interviews, speaking to diabetes patients, doctors, dietitians, and family members of patients. To kick off our research, we spoke to a doctor who worked at a diabetes clinic at a city hospital in Brooklyn. From our interview with her, we were able to understand the current medical support system that is offered to diabetes patients. A key learning that we received from her is that the patient actually is often already aware of what steps they need to take to stay healthy. In order to recruit for type 2 diabetes patients who fall within our user group, we distributed screener surveys via Ethnio, and recruited interviewees from Facebook support groups and diabetes clinics. Concurrently, we distributed a survey through diabetes focused social media groups and our personal networks. We synthesized the findings from our primary research in an observation clustering exercise. 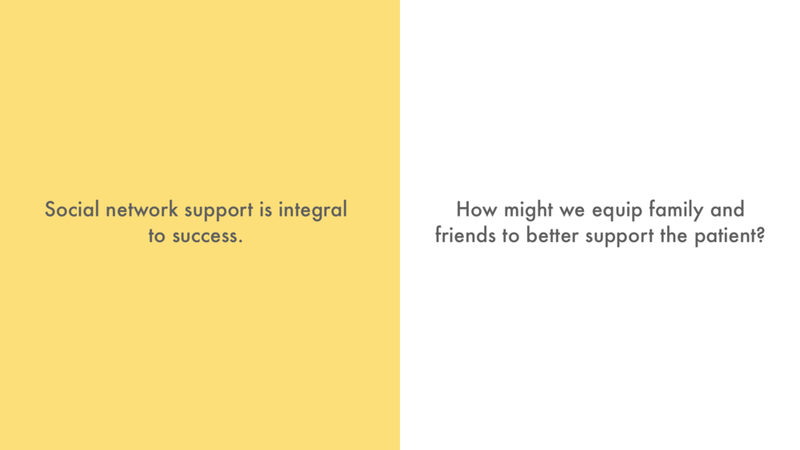 Through this synthesis, we were able to come up with three key takeaways which we turned into "How Might We" statements that helped to inform our solution. Because Type 2 Diabetes outcomes are so driven by behavior, we realized that in order to improve outcomes we needed to tackle changing the behaviors of our users. Although both eating and exercising play a role in diabetes management, we concluded that eating behavior was the most impactful behavior for us to change. Through our literature review, we discovered the book "Nudge: Improving Decisions About Health, Wealth, and Happiness." This book was written by Nobel Prize Winner Peter Thaler, and discusses how we might change people's behaviors through design. From this book, we discovered that behavior change requires starting small, learning in bite sized pieces, and offering continuous social motivation. Since we decided to target millennials, we wanted to approach to gamify the experience. We explored different points in the patients food journey -- grocery shopping and cooking. We also considered different media - did we want to create an app or a physical board game? Diabeatit is an Instagram-based food competition that challenges the way you eat. Themed challenges are run on a biweekly basis, and three finalists are chosen and featured on the official Instagram account alongside the recipes. The finalists will be chosen primarily on healthiness, judged by licensed dietitians. However, the presentation and popularity will also be taken into account. After the finalists are chosen, the winner will be announced and receive a sponsored box of healthy snacks as a reward. The recipes on the account also function as a repository of recipes for lurkers on the account who are not actively competing in the challenges. We decided to pick Instagram because we wanted to tap into the existing behaviors of millennials. Today, 59% of millennials use Instagram, and 63% of them post food photos on social media. The hashtag #foodporn has been used 1.1 million times to date. In addition, leveraging Instagram instead of building our own app meant that we could run a few challenges without actually having to build out the platform. 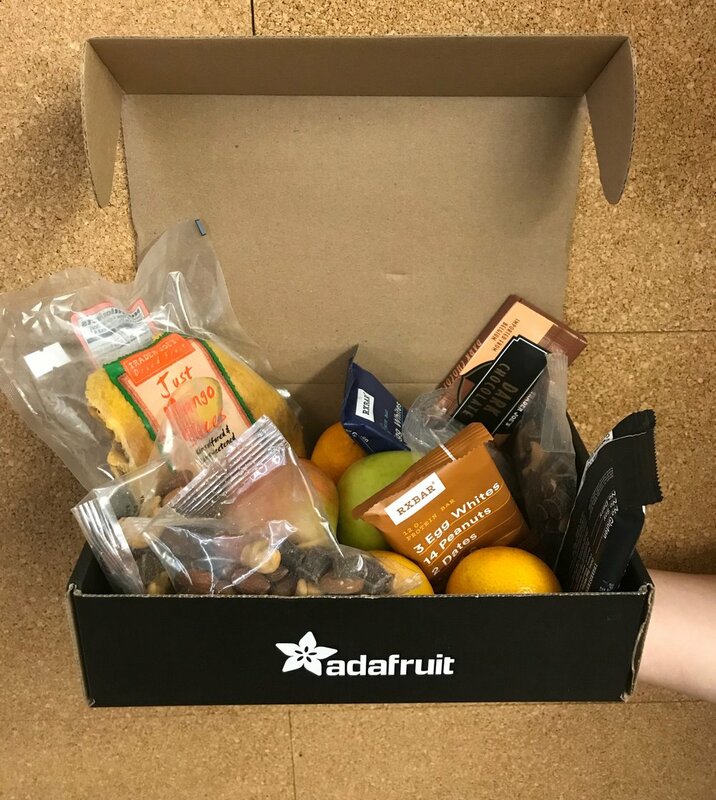 Our reward box acts as a tangible incentive to keep users engaged in our competition. There is a lot of potential in the future to make partnerships with snack companies to provide snack samples for these boxes. Therefore, we would only need to pay the shipping costs of these reward boxes, and offer free organic advertising to the snack companies. To test out our competition, we ran a limited challenge amongst our SVA community. Within a week, we were able to get 53 entries. We also were able to get 108 followers within the first week organically. However, we ran into a few problems in our first iteration. 1. Originally, we were going to require a recipe to be submitted per entry in order to be eligible for competition. However, through interviewing our potential entrants, we realized that this was a major blocker to entering the competition. Although people had made eligible dishes, the amount of effort needed to type up the recipe was often too much of a hassle for users to submit. We instead changed the requirement to be that finalists needed to submit recipes when they were chosen. That way they there is a low bar to initially enter. 2. There was concern that some of the entries were not actually cooked by the person submitting the entry. We decided to correct for this by requiring quick snapshots of the process in order to validate the authenticity. What we consider a major selling point is the fact that our project can be grown organically without funding. Like many social media influencers, we'd like to start our MVP with just using Instagram and some relationship with a few key influencers already on social media. We also thought of a four phased approach to building our business. In our second phase, we want to add extra features such as guest chefs and in-house dietitians. 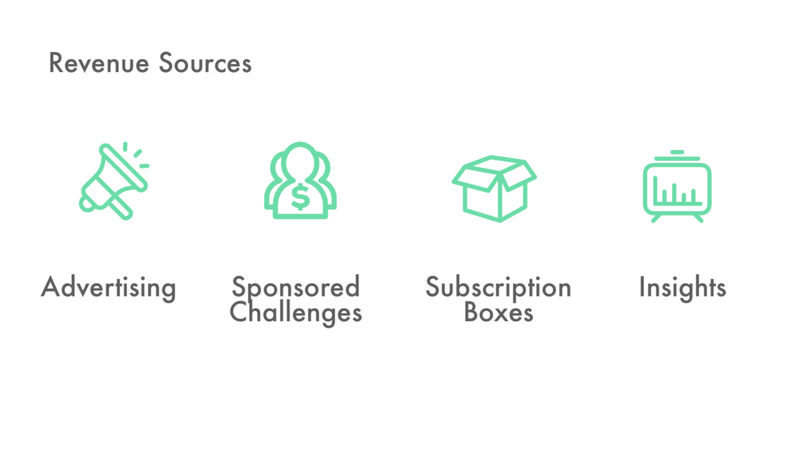 We will also start to leverage our users to get brand partners such as Whole Foods, Kraft, or Nestle to start providing sponsored prizes in Phase 3. In the near future, we can also provide analytics to healthcare companies who are interested in our demographic, and even extend this model to other behavior driven chronic illnesses. In order to make our project economically viable, we also considered revenue streams above. 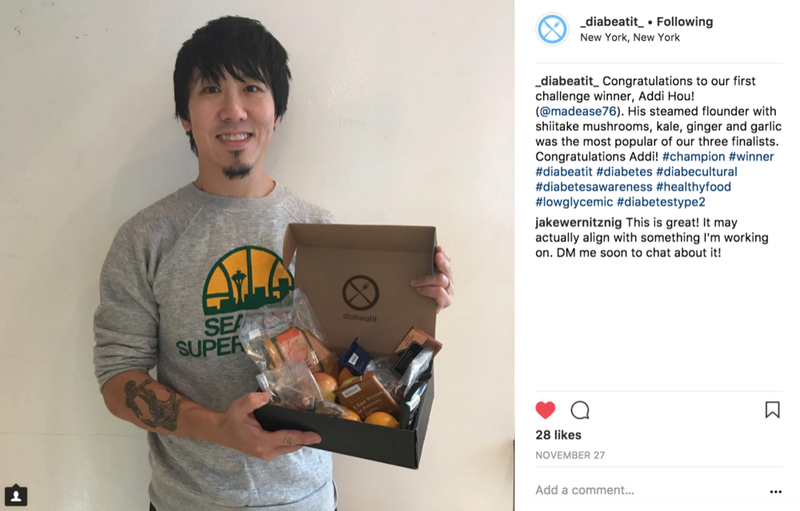 We are currently in the process of reaching out to social media influencers on Instagram and Facebook to start getting publicity for our second challenge open to the full diabetes community.